Taking cues from traditional wrought iron furniture found outside on porches and in gardens since the early 1800s, the Dogwood Collection was created by Meadowcraft over 50 years ago and still endures today. The secret to this collection's longevity and success lies in the classic design elements that will never go out style, design elements that can be found in the Dogwood Chaise Lounge pictured above. The filigree pattern found on the side panels, arm rests and crest of the back has been used for centuries in wrought iron garden furniture, a classic floral design that will surely be popular 50 years from today. Place this chaise lounge in a sun room for an exceptional seat to lounge and read books, or place it next to the swimming pool so guests can sunbathe or simply dry off after a swim. 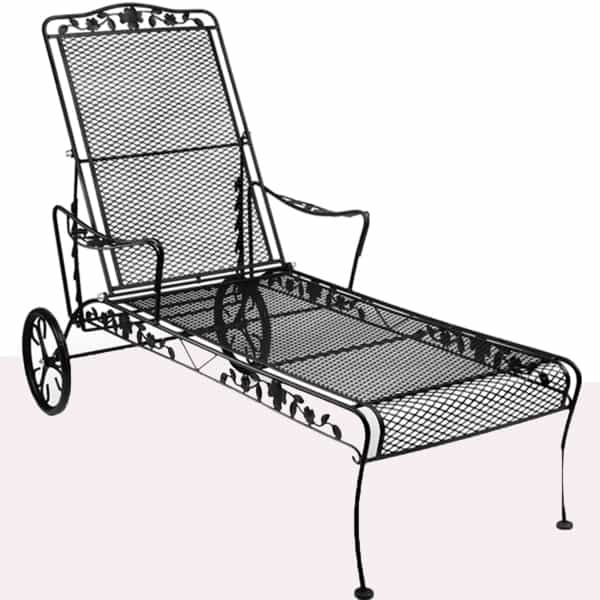 This chaise lounge features a baked-on powder coating that prevents water damage and rust, both traditional drawbacks of wrought iron from the past.